What is Nigella - Kalonji - Charnushka - Black Caraway? 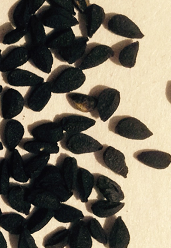 Nigella - Kalonji - Charnushka - Black Caraway, from an annual plant, is a little triangular black seed with a somewhat oregano-like, peppery taste. These seeds can be used as an alternative to pepper. Its similar to onion seed, and is many times confused with Kala Jeera - Black Cumin. Nigella - Kalonji is an essential ingredient in Panch phoran (Bengali five spice blend), an Indian spice mixture used to season legumes and vegetables. What is the Origin of Nigella - Kalonji - Charnushka? This spice is indigenous to Asia, Middle East and Europe; and, grown in India. This spice is good for foods like: breads (New York Rye, Naan), chicken, chutneys, lamb, legumes, pickles, salads, vegetables, and yogurt. These seeds are used primarily in Indian and Middle Eastern cuisines. What Are the Health Benefits of Nigella - Kalonji? These seeds have been used to ease indigestion, and are considered to be a carminative (relieve flatulence).